A Holiday always gives everyone a great time out from their busy schedule. Deciding to take a break from our everyday busy schedules is always important at a point in time and if you can add adventure tourism to your holiday it becomes even more exciting. Adventure Tourism in Kerala feature quite a variety of activities such as Paragliding, Bamboo Rafting, Mountain Climbing, nature walking,Tree House Stay , cycling and camping out, while taking walks in to the forests and climbing hills are some of the more known frills to be seen. The fact that these holidays help people bond more especially in families is also an encouraging factor. This is due to the fact that the basic human relations which get developed during adventure holidays such as team work and cooperation bring out the best in individuals. Kerala is ideal for adventure activities as a place dotted with rivers, beaches and hills, the potential seems far from realised. Trekking, rock climbing, camping in hills and water-based adventure activities like kayaking, canoeing and yachting are popular adventure activities in Kerala. Kerala is a pupular tourist destination for Surfing enthusiasts in India and Kannur, Kovalam and Varkala are among the best destinations to surf in India. January and February are the best months to surf in Kerala when you get the best swell size for waves. For any surfer in the world, a wave with no one else on it to surf is a priceless experience and that is what makes Kerala a unique surfing destination. -Soul & Surf (soulandsurf.com) in Varkala is a popular surfing trainer in Kerala and their programs includes accommodation, breakfast and guiding. The seven months post the south-west monsoon is ideal for aero sports in Kerala, since wind speed and quality are predictable and is safe for adventure enthusiasts who are looking to experience paragliding. Paragiding is a sport in which the pilot can fly a lightweight, free-flying, foot-launched glider aircraft in air from top of hills and flies over plains and the pilot flies from below a harness suspended below a light weight wing. 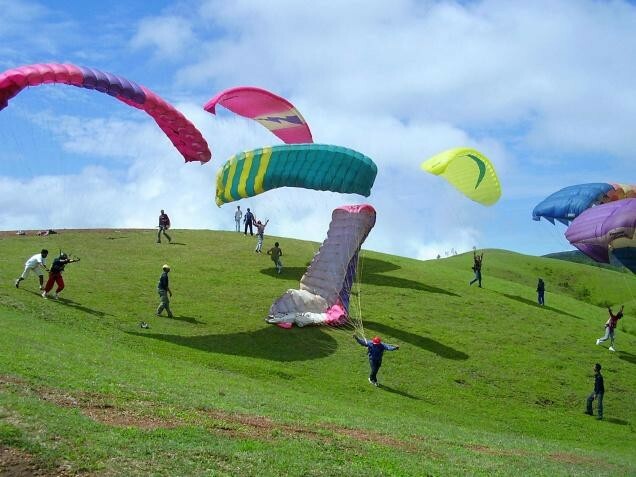 – Vagamon in Idukki district is now turning into a popular hub for paragliding in the State. 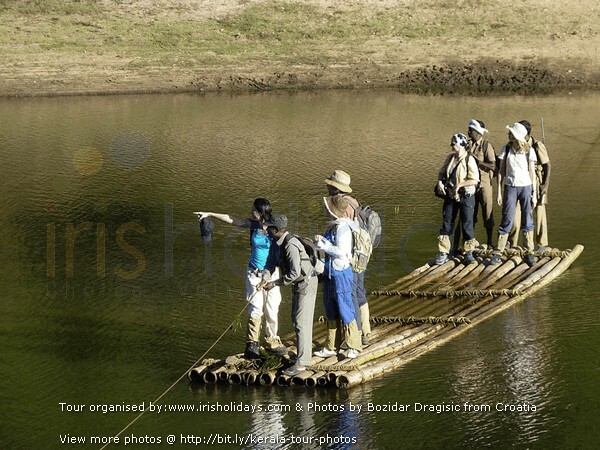 – Thekkady in Kerala is among the best places in India for bamboo rafting. Thekkady in Kerala is among the best places in India for bamboo rafting. An activity that readily catches the attention of many is the Mountain climbing. It is a known fact that mountain climbing is a mentally challenging and fitness building sport but it can also be so much fun. The availability of mountain climbing spots in Kerala ensure that the adventure is as intense as you want it to be whilst retaining the element of fun. Normally it takes a full day to climb the mountain and so quite a number of preparations have to go into it such as the use of repellants and feeding plans. – Munnar, Wayanad, Thenmala and Thekkady are popular destinations in Kerala for mountain climbing. 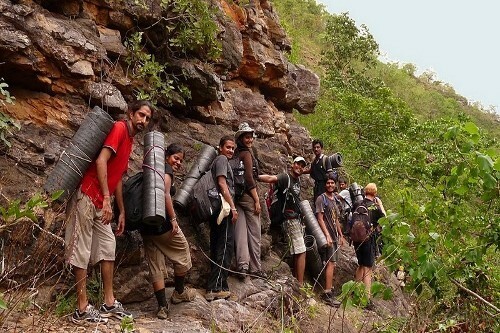 Munnar, Wayanad, Thenmala and Thekkady are popular destinations in Kerala for mountain climbing. 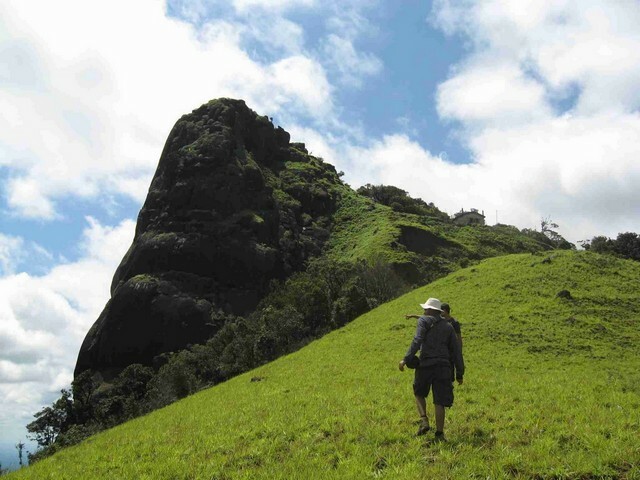 For those who however have the fear of heights or are just not up to the challenging task of mountain climbing, there are also trekking activities which can be arranged to go on for days so as to ensure that visitors enjoy the forests fully. Cooking and sleeping will be done in the jungle and the mystery filled forests of Kerala will be enjoyed during this adventure. – Chembara Peak in Wayanad, Meesapulimala and Kolukkumalai in Munnar and parts of mountain ranges near Thenmala are ideal for trekking in Kerala. Chembara Peak in Wayanad, Meesapulimala and Kolukkumalai in Munnar and parts of mountain ranges near Thenmala are ideal for trekking in Kerala. 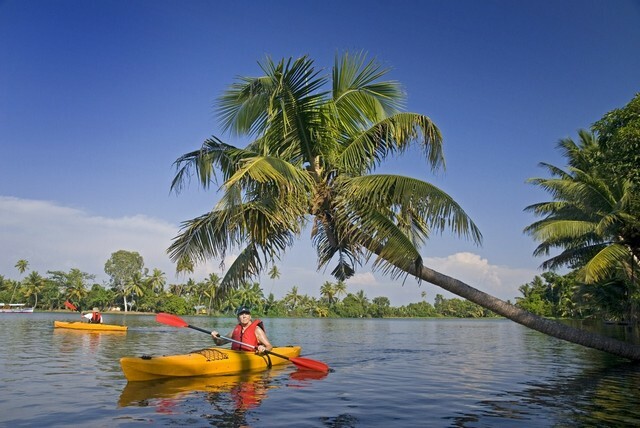 For those who prefer the sight of the rivers and are much more at home with the water bodies, the canoeing and Kayaking opportunities in backwaters of Kerala in Alleppey, Kumarakom and Kannur get many visitors instantly excited as the Kerala culture and cuisine gets to be experienced fully even while being on a kayaking trip. – Alleppey is the best best place to paddle and do kayaking in India and kayaking in ALleppey is a culinary and cultural adventure. 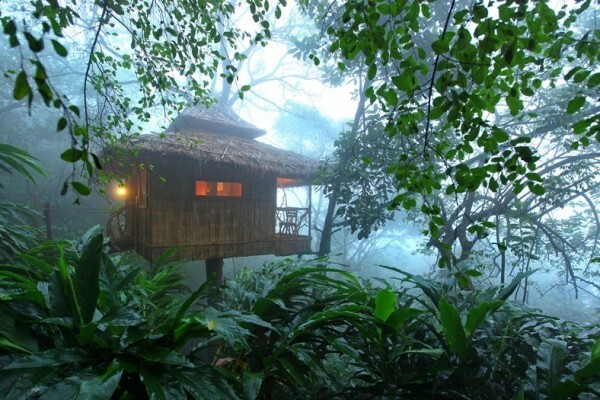 Kerala also has exquisitely designed tree houses inside forests and on the top of the mountains. Most of the treehouses are operated by owners who are passionate about eco friendly architecture and have balconies that feature display of the surrounding forest, creating the true experience to immerse in nature. – Munnar, Thekkady, Athirappilly and Wayanad has Kerala treehouse and http://www.keralatreehouse.in is a website that can help you to choose the correct treehoue stay in boutique treehouse resorts in Kerala. Treehouse in Kerala is creating the true experience to immerse in nature. 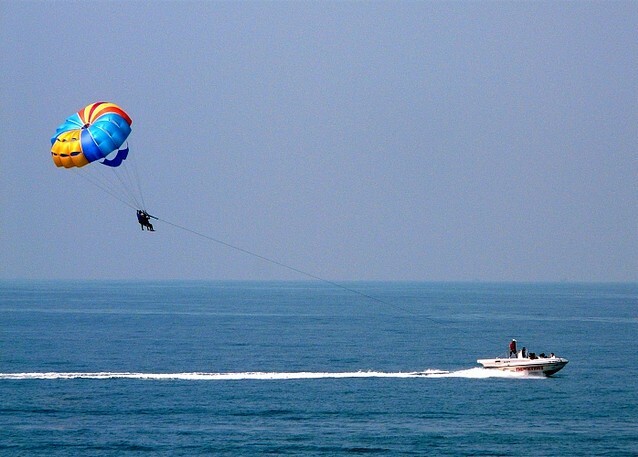 Parasailing is a water sport commonly indulged in beaches and sea side resorts. The sailor is strapped to a parachute which in turn is attached by a harness to a motor boat or some such small vessel . October to March which is the peak season to enjoy the best para sailing experience in Kerala. In this period that comes after monsoon , the skies are clear and cloudless and the temperature and flow of wind is just ideal to enjoy para sailing. The water in the sea is also calm and placid and you have a very fine experience. -Jeep Safari in Kerala is available in Thekkady, Munnar and Wayanad in Kerala. 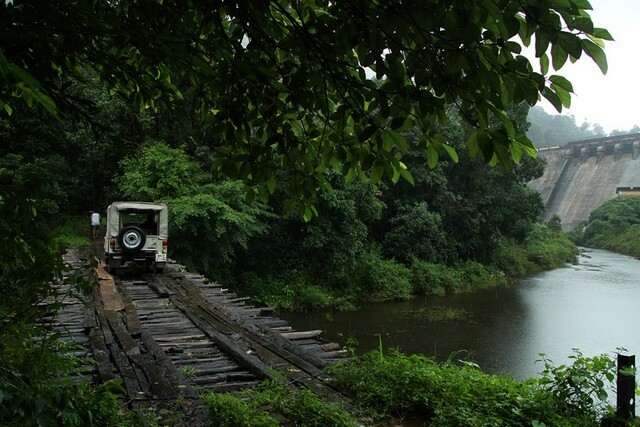 Jeep Safari in Kerala is available in Thekkady, Munnar and Wayanad in Kerala. A catamaran is small often wooden vessel with twin hulls joined together, which usually set sail across the backwaters of Kerala. 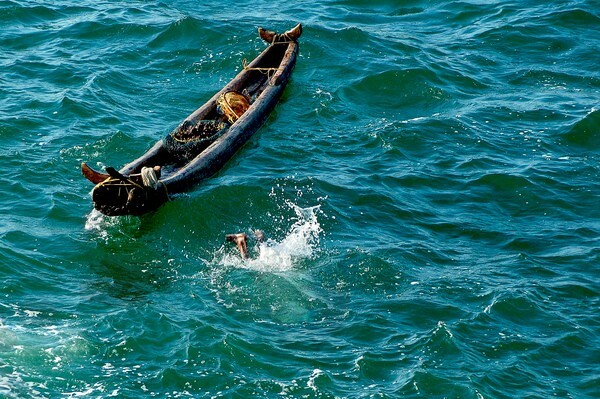 The word ‘Catamaran’ actually derived from the Tamil word “Kattu Maram”, meaning wooden logs and was used in South India in wars in the ancient days. Motorized catamarans are also in use to promote adventure tourism in Kerala and unlike a boat or houseboat travelling in a Catamaran is a daring attempt to conquer water. Paramotoring sets a paraglider pilot free from the limitation of being on a hill to launch and also eliminates the restrictions of weather parameters and for lot of would be flyers, this is a chance to survey Kerala’s green, god’s-own-country landscape from the air.Paramotors come in different sizes, each with slightly differing capabilities. 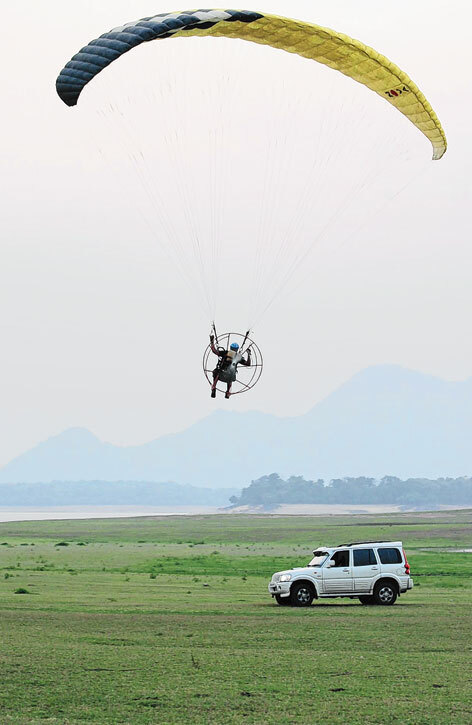 Firstly, there are the foot-launched paramotors and the paramotor trikes. Some of his smaller trikes carry a maximum of 16 litres of petrol and can even stay airborne for upto seven hours with one person on board. With two people the same machine can stay in the air for about three hours. Para-motoring can be promoted in beaches like Muzhipilangad, Payyambalam and Varkala. Maramadi or Bull Races is held every year in Kerala during the post-harvest season. Unlike the Spanish bull fights, maramadi happens in paddy fields after the harvest. Each team in Maramadi consists of three guides and two bulls and human masters have the important role of guiding the bulls during the race.Bulls are bred and raised specifically for the purpose of running in Maramadi competitions. They are well fed and groomed, and on the big day they are dressed in bright colors and have their horns painted. 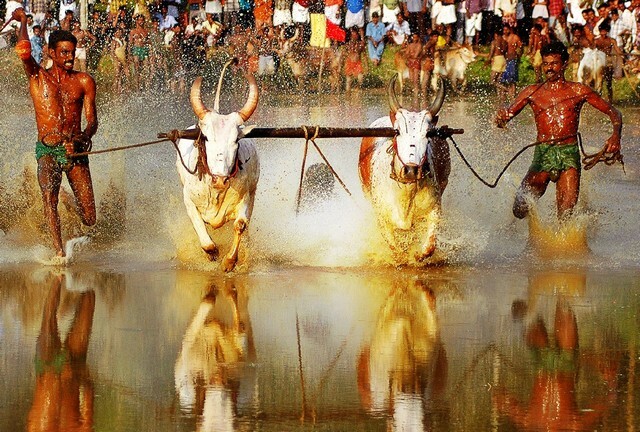 Anandapali village, located in the Pathnamthitta District and villages in Palakkad districts are ideal place to take part in Bull race as a spectator.